You have to treat yourself sometimes! I had fun making lunch last night. I think it might be smelling up my office though. So I am going to close the lid and eat it outside where people won’t be bothered by it. The star is a tofu hamburger patty. Its made, by taking a package of tofu and removing a large amount of the water from it and then mixing that with ground beef or pork (about 200g). I prefer pork because I think it brings a flavor element to food that beef never seems to have. I also usually add fresh ingredients like chopped onion, garlic, finely chopped carrots, chives, and ginger. I eyeball the amounts until I get the consistency that is easy to form. If you add to much the tofu/meat party will lose its shape when cooking. After that is all incorporated, I add some seasoning. This hambagu is very simple, because I knew I was going to be putting curry on top for color. In the past I season with soy sauce, sesame oil, salt and pepper. Simple, but sometimes simple is best. 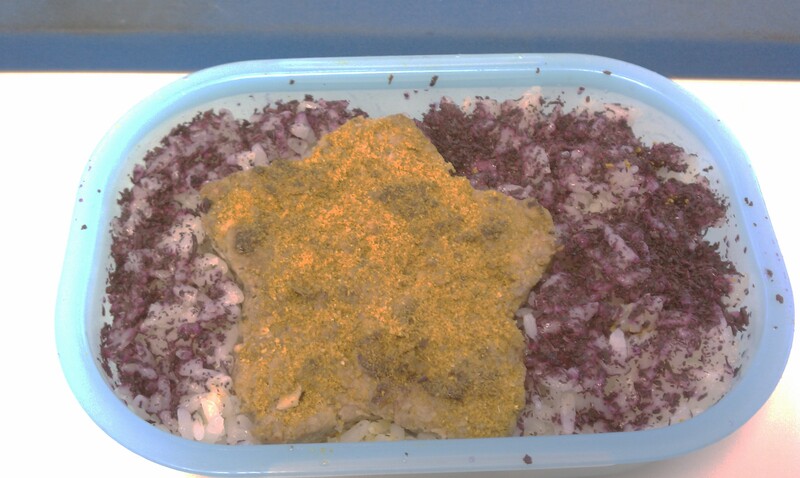 On the rice, is Shiso furikake. It makes rice kind of purple. I was looking for a night sky with a taste that might work with the curry star patty. Shiso is tart and a bit salty. Along with the few other things I had for lunch, I really enjoyed it. I’ll have to find a new shape to make lunch so I can do this again. ← The power of “first loves”. Looks so Nummy! You’re an Foodie Artist, Tessa!